Felting fun with Robbin Firth! 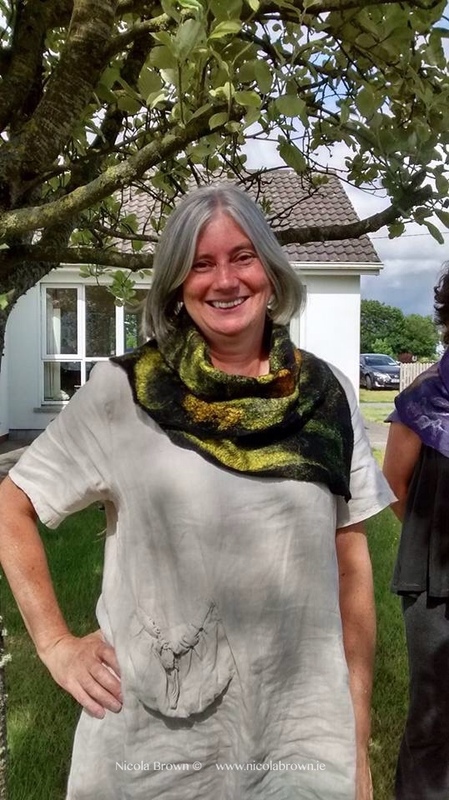 Thanks a million Anita for inviting the wonderful Robbin Firth of Heartfelt Silks to Ireland, I had such fun today learning different ways in which Robin and Harry’s palm wash boards can help in the felting process. It’s always good to up-skill! 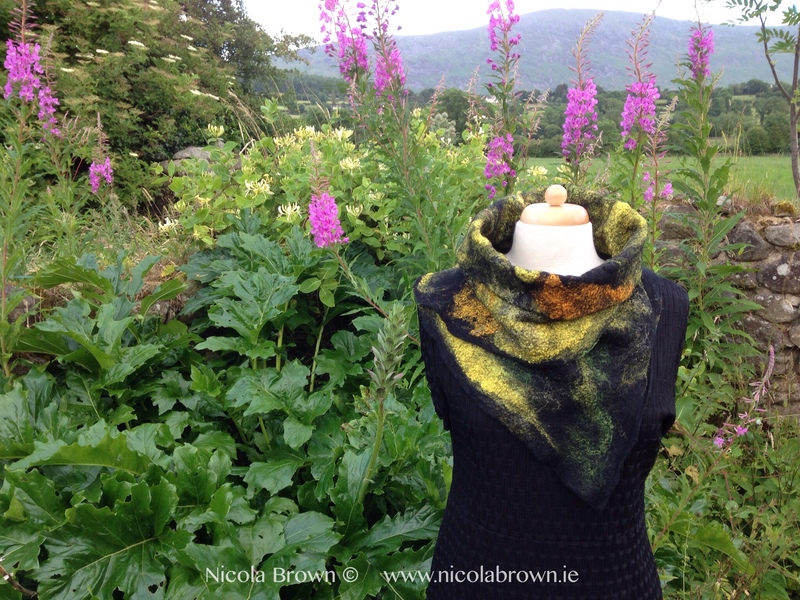 During the course of the day each participant felted two pieces, first a beautiful merino and silk cowl then a gorgeous raw lock scarf. I’m particularly happy with the cowl that I made and know I can apply the technique we used for more complex clothing projects in the future. I made mine totally reversible and like the way it may be worn in many different ways with different colours of embellishment showing. It’s always good to work with Roo Kline’s fab hand dyed fibres! I selected some lovely yellow silk and green throwster’s waste from Anita’s class supplies then added copious amounts of Roo’s Firestar, sari silk threads and bamboo fibre on top. The result is a shimmering lustrous surface as seen in the below close up shot, lovely! The final fun thing of the day was catching up with good friends Mairead and Ruth in the class as well as meeting facebook friend Juliette for the first time. I also met Anita’s students Jane and Laura, how this felting lark unites us all!!! Thanks Ruth for taking this photo of me and many thanks once more to Anita, Robbin and Kirsten for all your help and inspiration! 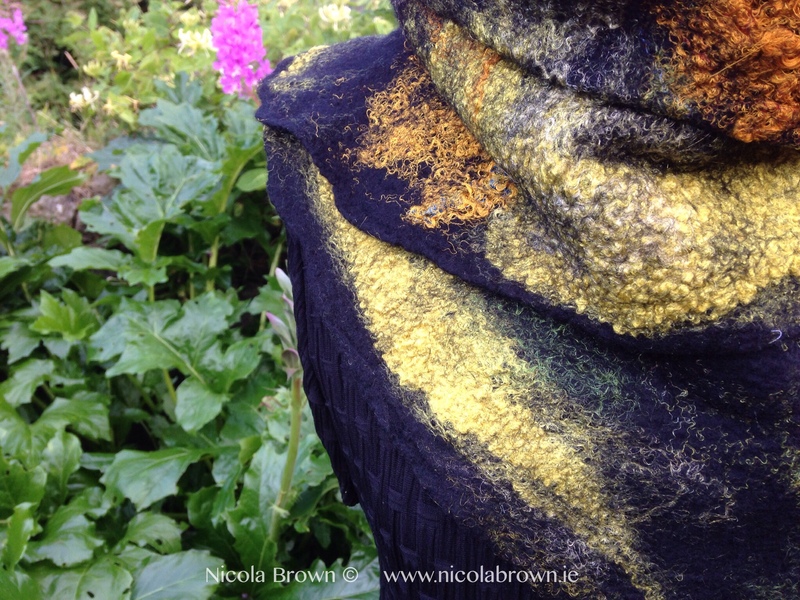 This entry was posted in Felt, felting worksho, felting workshops and tagged Anita Marnell, Felt, felt cowl, Heartfelt Silks, Robbin Firth by Nicola. Bookmark the permalink. 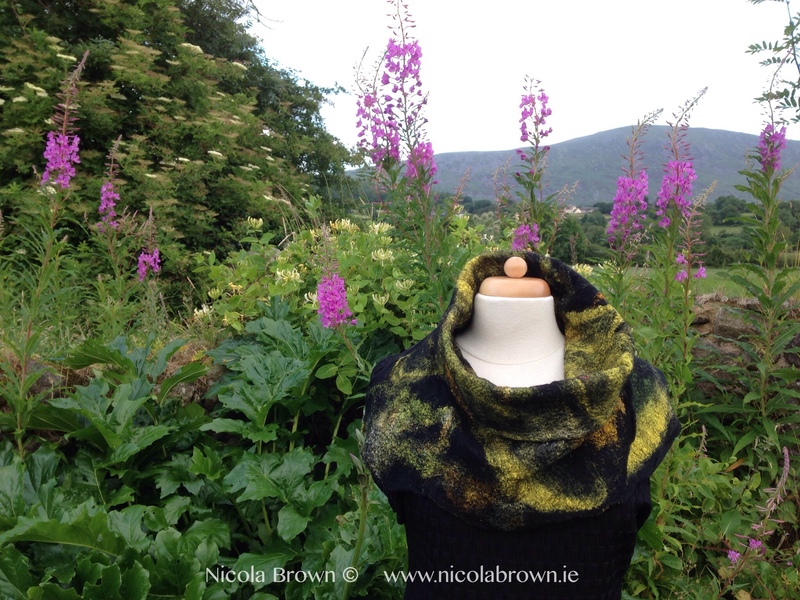 I love this cowl…..it is absolutely gorgeous. Wish I could have joined you….I know that there had to be lots of laughter and fun in Robbin’s workshop. Wow, What a beautiful cowl. Love how the colors pop against the dark background. It is so much fun to connect with good friends, especially in a class where you are creating such lovely pieces. Thanks for posting Roo Kline’s fibers on your blog. Ordered some beautiful bamboo and look forward to using some in my nuno shawls. Have a wonderful week. I love the color against the black background! So wonderful.